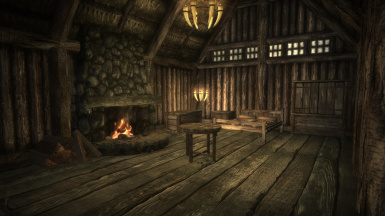 Hearth Craft uses the framework of Chesko's Campfire to add craftable, placeable furniture, clutter, and more. Chesko for Campfire and the modding framework it provides. kryptopyr for scripting help and supporting compatibility with her mods. morganmarz for Hearthfire Lumber Dialogue Requirements Removed, from which I've included the changes to the Heathfire lumber dialogue. InsanitySorrow for the Christmas Resource package and Insanity's Headstones. Oaristys for the Modder's Resource Pack. for the Orc Hut Kit. Fixed an issue with the Dwemer Chest (DweContainer02) that prevented it from appearing when placed. Corrected the recipe for the Wall Horn Candleholder to require only 1 Iron Ingot and 1 Goat Horn. Added snow and rock detection, so objects like igloos, snowmen, and rock cairns will only be craftable if the appropriate resource is available. 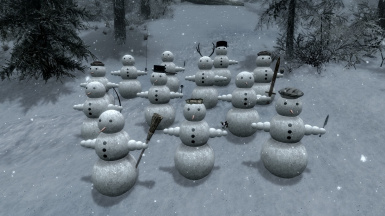 Added craftable, placeable Snowmen (based on the snowman from InsanitySorrow's Christmas Resource package). Added a craftable, placeable travel Shrine to Talos (concept and mesh courtesy of Teabag86). Added a craftable, placeable cooking stand. Added Varnish to merchant levelled list. Injected a number of records into Update.esm. Added Uninstall functionality to remove Hearth Craft's records from Campfire's FormID Lists. 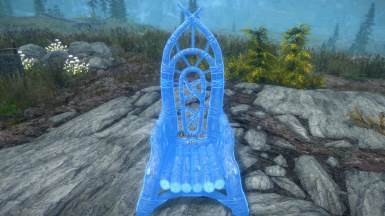 Added craftable, placeable Fine, Noble, Dwarven, and Orcish furniture. Added craftable, placeable Crucified Skeletons, Crystal Balls, Scarecrows, Skull Totems, and Wine Racks (all from Oaristys' Modder's Resource Pack). Added craftable, placeable, harvestable piles of Ingots, Ores, and Skulls (all from Oaristys' Modder's Resource Pack). Added craftable, placeable Anvil, Archery Target, Cooking Spit, and Rock Cairns. Added craftable, placeable versions of vanilla baskets. When a vanilla basket is added to your inventory, Hearth Craft will swap it for a placeable version. Toggleable in the MCM. Added craftable, placeable Gravestones (from Insanity's Headstones). Added the Wispmother's Tear (a craftable, placeable gem which generates fog whereever it's placed). Added the missing meshes and textures for the Portable Hole. 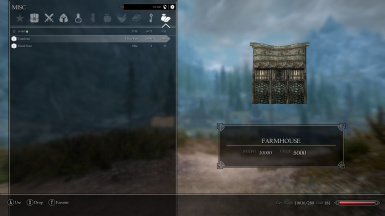 Added five more craftable, placeable Farmhouses, as well as a Longhouse (based on FarmInn01). Added a craftable, placeable Orc Longhouse, as well as an Orc Hut (using Markus Liberty's Orc Hut Kit). Added craftable, placeable Igloos (from InsanitySorrow's Christmas Resource package). The base version is not persistent, but upgraded into a permanent version using Frost Salts or Ice Wraith Teeth. Updated the scripts used for building doors so followers will now accompany you into the placeable buildings. Removed Sawn Logs from merchant levelled lists. 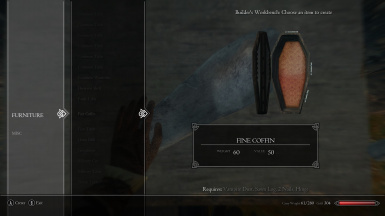 Incorporated the changes from morganmarz's Hearthfire Lumber Dialogue Requirements Removed (http://www.nexusmods.com/skyrim/mods/73131/). Removed direct edits to Campfire's FormID Lists; additions are now made via script at run time. Added CCOR versions of the Ingot and Ore Piles, with different weights and values. If CCOR installed, Hearth Craft will automatically change the recipes to craft these versions instead. 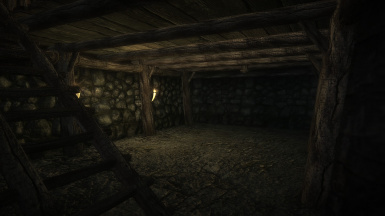 Added craftable, placeable Horn Chandeliers, Horn Candleholders (Table), and Horn Candleholders (Wall). Added a recipe for the Builder's Workbench to Craft Item: Survival Skills. Removed an unnecessary and potentially problematic line of code from MNPS_HomeTeleport script. Added craftable, placeable farmhouse with it's own interior cell. Added craftable, placeable wood piles (firewood and deadwood). Added craftable, placeable horncandle holder (floor version). 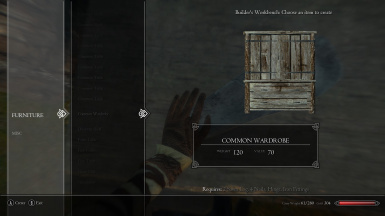 Fixed path for CommonChair01 inventory model. Removed bsInvMarker from hide fence inventory models which were causing CTD for some users. Adjusted position of the Builder's Workbench in Iverstead to avoid clipping the notice board placed there by the Notice Board mod. Lowered the value of firewood from 5 to 2. Incoporated my Portable Hole mod; it can be disabled in the MCM for users who'd prefer not to use it. 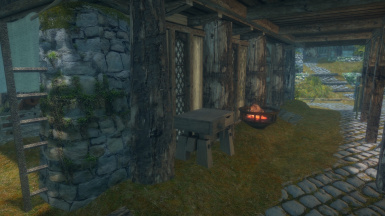 Hearth Craft uses the framework of Chesko's Campfire to add craftable, placeable furniture, clutter, and more. 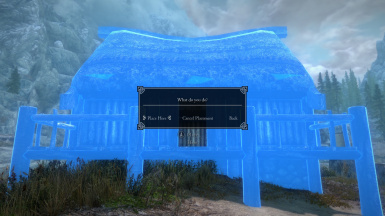 Wherever possible this is done in such a way as to work with and preserve the conventions of the Hearthfire DLC, without being constrained by its mechanics. 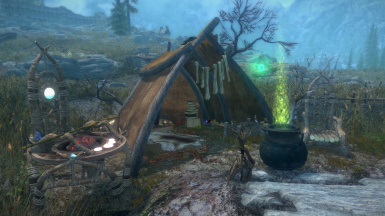 Although Hearth Craft enables you to craft items which may make some aspects of the game easier (particularly the crafting stations), care has been taken not to undermine Campfire, Frostfall, or other mods which support a survival playstyle. 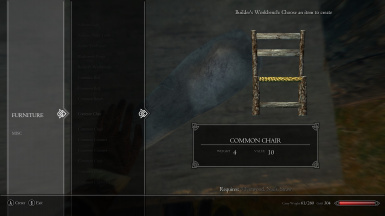 Item weight plays an important role in this; most of the added furniture and crafting stations have quasi-realistic weights that make hauling them around with you a very unattractive (and slow) prospect. These items are, by design, better suited for placement in a home or permanent camp. The Builder's Workbench, a new crafting station for making many of the items added by Hearth Craft. 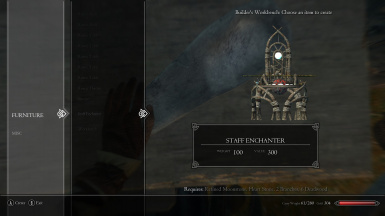 Placeable versions of vanilla & DLC crafting stations. A variety of other placeable objects. 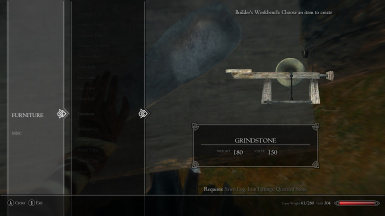 Breakdown recipes, with the option to require a Woodcutter's Axe to breakdown wood objects or a Pickaxe to breakdown stone objects. 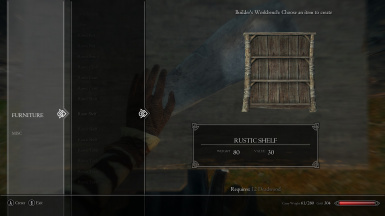 An MCM with options to disable Hearth Craft recipes based on several parameters. 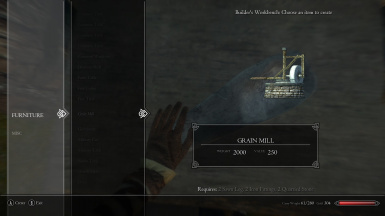 Integrated compatibility with Complete Crafting Overhaul Remade, Complete Alchemy and Cooking Overhaul, and other popular mods. Use a mod manager, or download Hearth Craft and drag the contents into the Data folder. Uninstalling a mod mid-playthrough is not recommend. 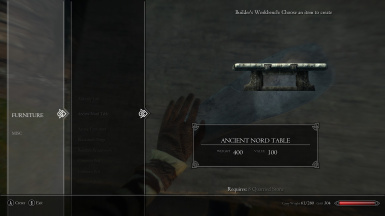 However, in the event you feel compelled to uninstall this mod, first pick up any placeables added by Hearth Craft. Then, activate the "Uninstall" option in the MCM, wait several moments, make a new save, exit the game, and deactivate or delete Hearth Craft. 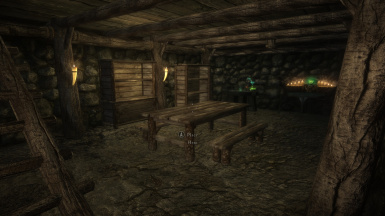 Hearth Craft touches a number of cells because it adds Builder's Workbenches to the various cities and towns of Skyrim. As a result, if it loads after a mod which makes changes to those cells, Hearth Craft may overwrite those changes with vanilla values. Creating a patch or adjusting the load order should address this issue. Hearth Craft makes changes to a handful of leveled lists, which should be merged into a bashed patch using Wrye Bash. Although Hearth Craft works perfectly fine without a third-party positioner, Jaxonz Positioner or Storage Helpers can be useful for tweaking placements or manipulating objects not added by Hearth Craft. Teabag86 for his help with testing, his advice and suggestions, and the concept and mesh for the travel Shrine of Talos. Markus Liberty for the Orc Hut Kit. A Builder's Workbench can be found in each community, but you can also craft a placeable version (at any Builder's Workbench or using Campfire's Survival Skills: Craft Item) to carry out to your own camp or settlement. 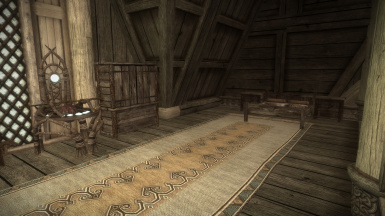 None of the placeable furniture or objects added by Hearth Craft have Navcut collision boxes, so actors may get hung up against them. As long as you avoid placing these items in the middle of commonly traveled paths, this should have a minimal impact on gameplay. Certain factors (such as the use of multiple followers) may exacerbate the issue, so I'll continue to look for a viable way to address this. Each placeable container shares its inventory space with all other identical containers; all Common Cupboards, for example, share the same inventory space (essentially cloud storage). This is a function of using the Campfire framework, so I won't be changing it. 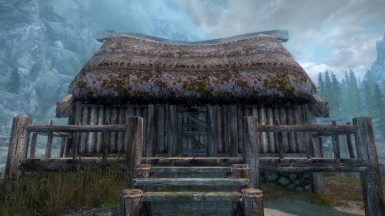 Build homes such as farmhouses, orc longhouses, and igloos, and place them anywhere you like for your character to live in and furnish. Interiors are fully NavMeshed and followers will accompany you inside. When placing buildings, be patient; the indicator can be a little slow to move because it's so big, especially if a lot of scripts are firing (such as when the game first loads). Moving: As far as Campfire is concerned, the "actual" placeable farmhouse is a pile of rubble which has been placed inside the farmhouse. This helps reinforce the idea that this is a permanent structure while also resolving an issue with the vertical positioning of the building. If you really need to move the farmhouse after you've placed it, turn collision off using the console (tcl), walk inside, and pick it up. Multiples: Although there's nothing stopping you from placing multiple homes, every identical placeable building is going to share the same interior cell. LOD: Buildings added by Hearth Craft don't have LOD. Craft a wide assortment of furniture and furnishings of varying quality. Containers are persistent, so they're a safe place to store your valuables (or anything else). 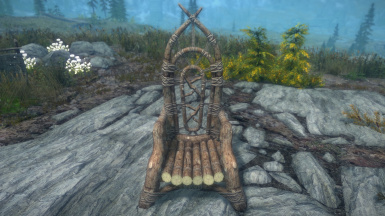 Rustic Furniture: Craftable with Deadwood using either the Builder's Workbench or Campfire's Survival Skills: Craft Item. 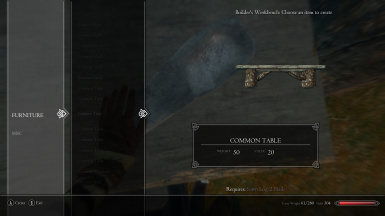 Common Furniture: Craftable with Firewood using the Builder's Workbench. 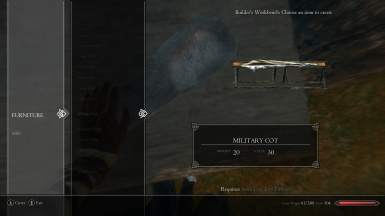 Fine Furniture: Craftable with Sawn Logs using the Builder's Workbench. 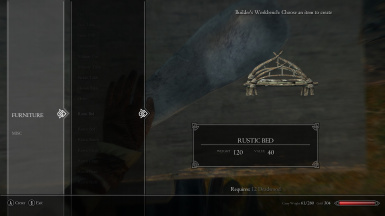 Noble Furniture: Craftable with Sawn Logs and Varnish using the Builder's Workbench. 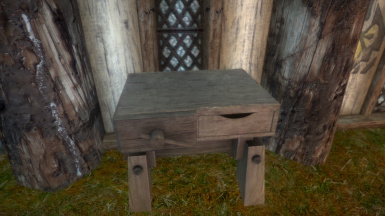 Other Furniture: Craft other types of furniture using the Builder's Workbench, including Dwarven furniture and Orcish furniture. 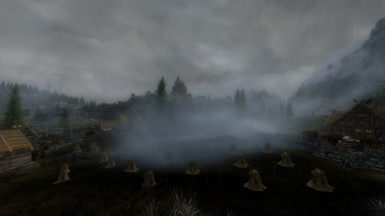 Alchemical Items: Craft a Portable Hole to store your loot or a Wispmother's Tear to blanket an area in fog. 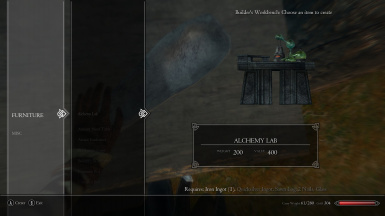 Alchemical items can be crafted in a Cooking Pot (or using the Alchemist's Retort, if CACO is installed). Harvestable Piles: Craft placeable piles of wood, ingots, ores, and more. "Pick Up" the pile to return it to your inventory, or "Use" it to take it apart and return its components to your inventory. 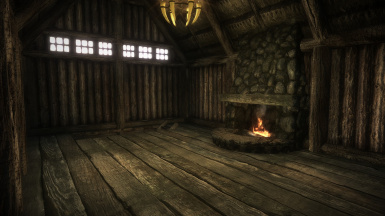 Placeable Vanilla Clutter: Where appropriate, Hearth Craft will swap out pieces of vanilla for its own placeable versions, which can then be dropped as normal or placed using Campfire's system. This feature can be toggle on or off in the MCM. 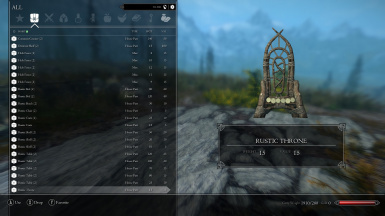 Initially, the only items affected by this are the various baskets found around Skyrim. Realistic Weights: Increases the weight of Clay to 10 and Quarried Stone to 15. Spriggans Drop Wood: Adds harvestable wood to dead spriggans; 1-2 Deadwood and 2-4 Branches to spriggans and 1-2 Deadwood to burnt spriggans.